Wedding invitations can seem overwhelming. Where do you shop for them? How much will they cost? And what else needs to be included aside from the main invite? These are all great questions that every bride asks herself. Unfortunately, some brides don’t get the answers they need and in turn feel stressed throughout the wedding invitation process. Ordering wedding invitations online can be a super simple process once you know what your doing. Thanks to Basic Invite and the tips they’re bringing us today on what to order, when to order, and answers to the age-old etiquette dilemma all of you brides-to-be will be invitation pros in no time. Personalize your wedding invitations with photos for a more personal touch! So, what all goes into a wedding suite? A straightforward question with a not-so-straightforward answer but once you know your options and weigh those against your needs it’s easy to navigate. Start with the wedding invitation. This is going to be the main focus of your suite. Be sure to include all the main event details here – who, what, where, when, and why. Next, the enclosure cards – a rule of thumb to follow is if it doesn’t apply let it fly. Not every couple needs to include every enclosure card. Enclosures include rsvp, direction, accommodation, reception, and registry cards. 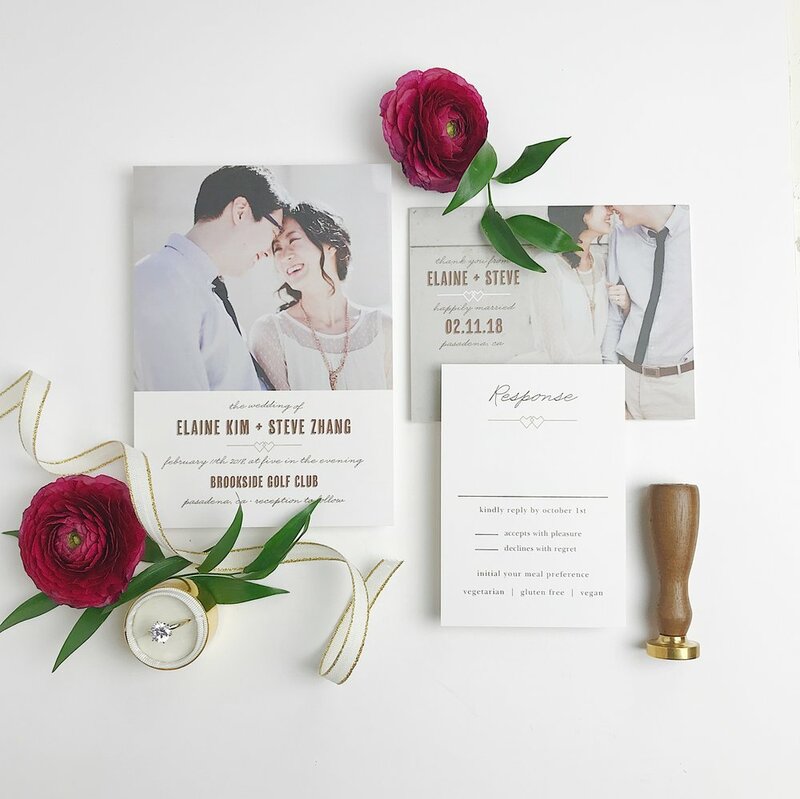 How should a wedding invitation suite be put together? There are a couple options when it comes to how an invitation suite is assembled. Option one, go for a standard suite where each card it stacked on top of one another then secured with a belly band or ribbon to keep each suite placed nicely inside of their envelope. Option two, opt for a pocket. These are a fancy and super organized way to deliver your invites. The invitation will be placed on the left inside flap and each enclosure will be nicely stacked on top of each other on the right inside flap where each card will be showcased flawlessly. Fold up the pocket and secure it with a sticker for a crisp look. It’s all up to you and what suites your style. What is the proper wedding invitation etiquette? There are various ways to follow proper wedding etiquette and when it comes to invitations there are two categories to consider. The first being timeline. Timing for wedding invitations is vital because you want to ensure your guests have ample time to check their calendar, respond, and prepare for your special day. Following the easy timeline guide below will help make things run smoothly. Next, wording. This is where things can get tricky, but don’t stress too much on wording etiquette. Use your best judgment especially when inviting someone divorced, remarried, or in a non-martial relationship. Etiquette can be taken to a whole other level when secular traditions are involved. Luckily Basic Invite has done all the hard work for you by creating a guide to help you out. Check out these easy to read guides on wedding etiquette and wording examples. Choosing a style and design is easy and once you know the ins and outs of it all so is creating a custom invitation suite for you! Don’t forget to use coupon code 15FF51 at checkout for 15% off your order and follow Basic Invite on all social media platforms at @basicinvite for all the invitation inspiration you can handle!